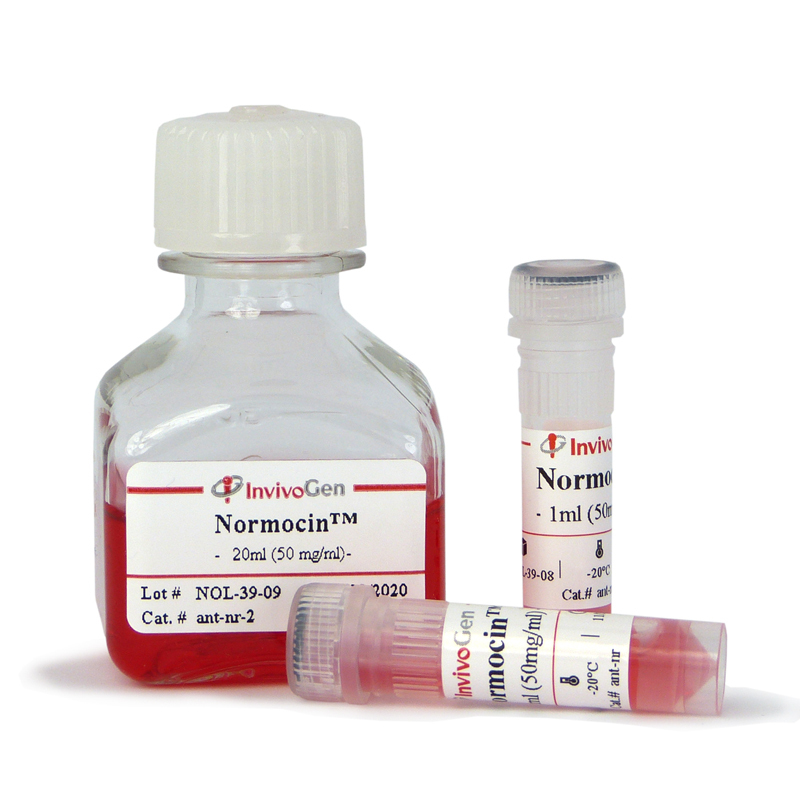 Normocin™ is provided as a cell culture tested, sterile filtered, red solution at a concentration of 50 mg/ml. Normocin™ is shipped at room temperature. The flagellin of candidate live biotherapeutic Enterococcus gallinarum MRx0518 is a potent immunostimulant. The Cytotoxic Necrotizing Factor of Yersinia pseudotuberculosis (CNFy) is Carried on Extracellular Membrane Vesicles to Host Cells. 2018 ‎Mol. Med	DOI: 10.1186/s10020-018-0009-6. Analysis of menstrual effluent: diagnostic potential for endometriosis. The Bacteroidales produce an N-acylated derivative of glycine with both cholesterol-solubilising and hemolytic activity. CpG-based immunotherapy impairs antitumor activity of BRAF inhibitors in a B-cell-dependent manner. 2017 J Mol Cell Cardiol. 111:69-80. Intramolecular signaling in a cardiac connexin: Role of cytoplasmic domain dimerization. Comparative Proteomics of Paired Vocal Fold and Oral Mucosa Fibroblasts. Effects of lipid A acyltransferases on the pathogenesis of F. novicida. Tuttle TR, Mierzwa ML, Wells SI, Fox SR, Ben-Jonathan N.
CCL2 Produced by the Glioma Microenvironment Is Essential for the Recruitment of Regulatory T Cells and Myeloid-Derived Suppressor Cells. 2016 Nat Struct Mol Biol. 23(4):286-92. Inhibition of telomerase RNA decay rescues telomerase deficiency caused by dyskerin or PARN defects. Structural characterisation of high affinity Siglec-2 (CD22) ligands in complex with whole Burkitt's lymphoma (BL) Daudi cells by NMR spectroscopy. Human caspase-4 mediates noncanonical inflammasome activation against gram-negative bacterial pathogens. Casson CN, Yu J, Reyes VM, Taschuk FO, Yadav A, Copenhaver AM, Nguyen HT, Collman RG, Shin S.
2015 Nat Struct Mol Biol. 22(10):824-31. Hamdorf M, Idica A, Zisoulis DG, Gamelin L, Martin C, Sanders KJ, Pedersen IM. 2014 J Control Release. 174:51-62. Evaluation of monophosphoryl lipid A as adjuvant for pulmonary delivered influenza vaccine. Patil HP, Murugappan S, ter Veer W, Meijerhof T, de Haan A, Frijlink HW, Wilschut J, Hinrichs WL, Huckriede A.
Hsu PD, Scott DA, Weinstein JA, Ran FA, Konermann S, Agarwala V, Li Y, Fine EJ, Wu X, Shalem O, Cradick TJ, Marraffini LA, Bao G, Zhang F.
Depletion of the 26S Proteasome Adaptor Ecm29 Increases Toll-Like Receptor 3 Signaling.